From my heart to your hands offers a complete line of quilt patterns for all levels of quilt makers with projects varying in size and degree of difficulty. Fabric kits are also available for many of the quilts. Check out the Quilt Kits link for more information! Lori Smith started her quilting business, From my heart to your hands, to share her passion for the art of quilt making with others. Her design philosophy explores and builds upon the quilt legacy of our ancestors. The artist enjoys combining hand applique with machine piecing for a stunning combination when creating her traditionally inspired quilt designs. 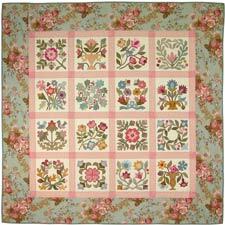 Please take a few moments to browse the site to see new and exciting quilt patterns. The quilts may be viewed by clicking on the appropriate Department listed on the left side of the web page. With the exception of the What’s New Link, all patterns appear only once on the site. Retail customers pay a flat rate of $2.25 per order for delivery within the United States and $7.50 per order for international delivery with secure online credit card payment and prompt delivery. When purchasing quilt kits, an additional shipping charge will be added for both US and international orders. The additional shipping fee will be displayed during check out. Note: The flat rate shipping fee covers the cost of shipping regardless the size of order. United States customers pay a single fee of $2.25 for shipping whether they order 1 or 5 patterns. The total price for shipping the order is $2.25 no matter how many patterns are ordered. International customers pay a single, one-time fee of $7.50 for shipping no matter how many patterns they order. Orders are shipped with the postal service using first class mail. However, additional shipping charges are added to orders that include quilt kits.The additional shipping fee will be displayed during check out. Credit card payment options include Visa and MasterCard. Payment by check or money order is also available during Check Out. Returns and exchanges are not available on printed material or quilt kits. This is a SSL Certified Site utilizing state-of-the-art SSL encryption technology to safely store and protect your credit card information. As a result, you can shop online knowing that your personal information is protected at the highest industry standards.